Why would you need a range bag? Well, for starters, if you like shooting, you should store your gear in a suitable place. And, preferably, not too cheap gear, I dare say. Secondly, I bet you are going to take your cool handgun or pistol out of the bag slowly and with an expressive gesture. Or without one, just grab it and shoot. Be it as it may, a tote case will be useless in that case. So, the primary function of a range bag is not just to keep the shooting necessities and other things inside, but to look just as stylish as its owner. How to Choose the Best Range Bag? Here are some tips that should help you find out what range bag would be best for you. The size of a range bag depends on the number of things you intend to put in there. A big range bag could fit a large set of your shooting gear, ammo, and other items required for your successful pastime on the weekend. On the other hand, such a bag is rather heavy by itself. You might reach your destination only to find yourself exhausted and without any desire to shoot. Consider getting a bag that is lightweight when empty. Of course, a range bag must be made from a sturdy material. All zippers should be durable enough. The handles, too, must be robust and well-sewn. A shoulder strap would be a welcome addition as well. For most shooters, carrying a full shooting range bag on a shoulder is more comfortable than an alternative. However, a high-quality range bag will not be affordable, as a rule. Nevertheless, valuable guns need the best protection at the same time. Besides, you would hardly buy a range bag good for just one year. The more pockets, the better. Actually, if your essentials are not numerous, there is no need to purchase a range bag with countless compartments. You risk spending a weekend over the bag trying to find the earplugs, for instance. Padded pockets are desirable. They will protect your valuables from damage. Removable slots will be very easy to wash. There are some models of range bags with hard foam slots. It’ll make a perfect protection for your pistols. This is a quality bag with plenty of space. The construction of the bag is strong. The main compartment of this range bag is quite roomy. You can easily accommodate a couple of your pistols, ammo, a stapler, target dots, glasses, ear plugs and other necessary items. The bag comes with a shoulder strap. The handles are sewn sturdily. There are two Velcro dividers inside the bag, which means they are customizable. Pistol rugs are well-padded for better protection of your shooting gear. There are two metal zippers on either side of this gun range bag. Each pocket has a padded pistol rug that could be removed anytime you like. Thanks to side pockets you can grab your necessary gear with ease. One more feature: the padlock holes are wide. Use a secure lock and keep your equipment securely. You can only buy it separately, however. This is the best gun range bag for two pistols. Also, it can be used as a medical bag. On top of all that, the bag holds its shape even when empty. A good choice for an excellent price. One of the most popular range bags. It looks good thanks to its colors. Black, olive green, sand-colored, navy and some others color schemes are available. We should warn you that bags of some colors might cost more than others. Explorer Bag designs and manufactures some of the best tactical range bags, rifle cases, police gear, gun cases, hiking and military backpacks. 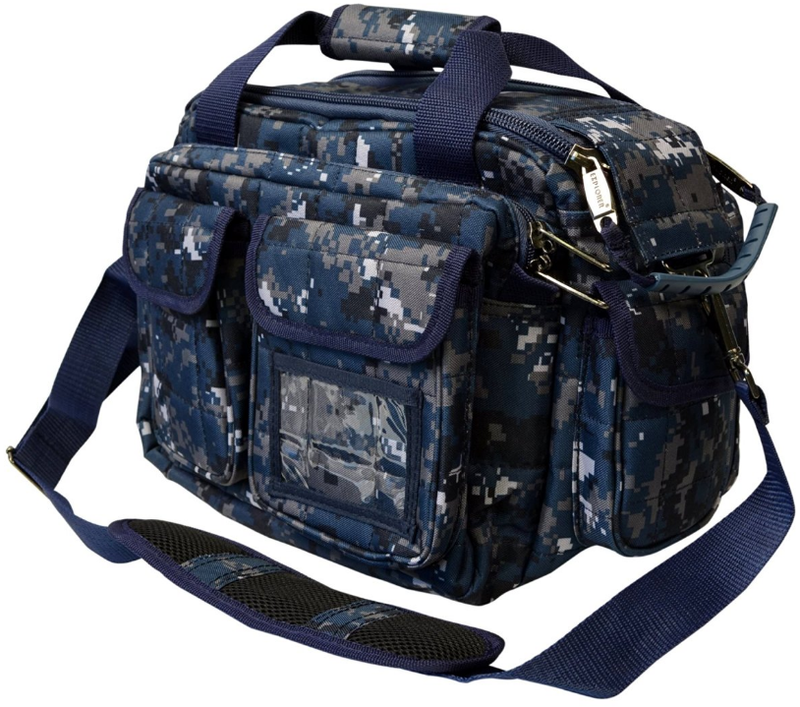 The Explorer Tactical 12 Pistol Padded Gun and Gear Bag is a compact and stylish case. It is very spacious and not too huge at the same time. 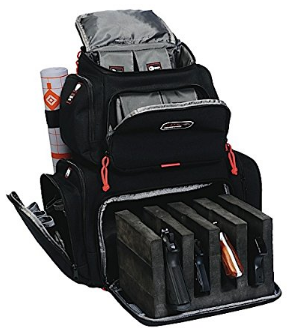 The gear bag comes with thirteen compartments! More than you’ve ever dreamed of. As we have already said, Explorer specializes in range bags, so this bag’s high quality shouldn’t even be questioned. There are plenty of pockets for perfect organization of your gear. The main compartment includes two weapon pouches. The durable zippers come with large holes for a keyed padlock. The bag could fit any heavy things. It is padded and securely stores your valuables, preventing damage. Just a note: this range bag comes without additional gun rugs. However, this fact could hardly lessen the joy this great gear bag can bring you. 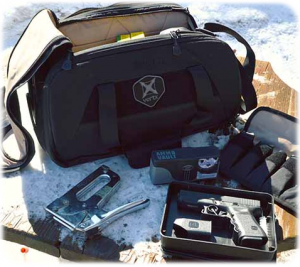 The Osage River Tactical Shooting Gun Range Bag is robust but also lightweight. It is made of 600D ballistic nylon. As you can see, that makes the bag durable enough to be resistant to damage. Nine storage compartments are at your disposal. All of your essentials, including a couple of handguns, magazines, glasses, knives, a speed loader, a stapler and other accessories and personal items could be placed there easily. This is the best compact and easy to carry bag. Zippers slide softly and come with locking rings. They could be used with a lock to keep your equipment secure. Two adjustable well-padded dividers inside the main compartment allow fitting your gear more comfortably. The exterior pockets are rather roomy. You can keep there many items, such as your ear and eye protection and other basic necessities. There are ten slots for magazines inside the bag. All that makes this bag is a perfect option for fans of range shooting or weekend hunting lovers. An excellent choice for an affordable price. 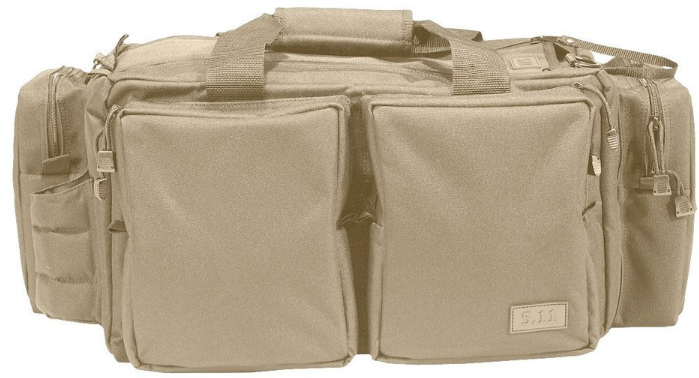 This gun range bag is available in olive green, black and tan. 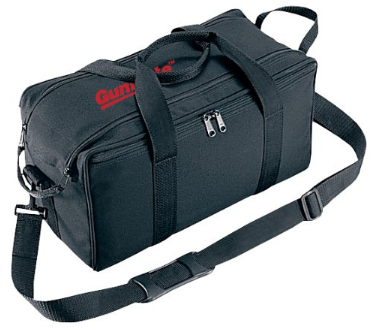 This is one of the best pistol range bags. Its construction allows storing all your shooting gear as securely as possible. The bag has slots where you could put four handguns in a vertical position. The slots are made of hard foam for the best protection of your valuable equipment. This backpack makes your hands free while moving to the range and from it. The main compartment is enormous. There is enough place for your ears, glasses, stapler, targets and other things you might need. Twelve pockets are meant for extra magazines storage. There are some small pockets for your valuables, too. The bag comes in black and camp colors. All zippers are sturdy. The handle and straps are well-sewn. The Handgunner Backpack by G.P.S. doesn’t look bulky, but it’s the best way to keep all of your necessities well-organized and easily accessible. You can accommodate plenty of things there, and there still will be enough place for anything else. Enjoy ranging with this bag. It is a product well-designed by the experts from G.P.S. The 5.11 is an American manufacturer of tactical equipment. It designs and makes not just clothing, but also gloves, boots, knives, and bags. 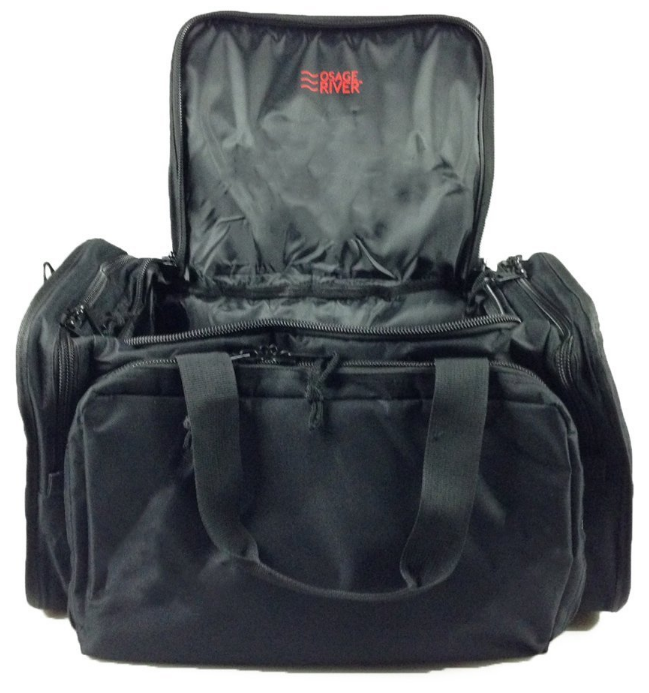 The 5.11 Range Ready Bag could be called the best tactical range bag without any exaggeration. The bag looks very nice and is organized perfectly. Its well-padded pockets are made for the best protection of your pistol gear during transporting. One of the side compartments has numerous slots where you can put knives, a stapler, a flashlight, and other not too bulky things. Some pockets are meant for your ear and eye protection. You can store up to eight magazines in this rather roomy bag. One more advantage of this range tactical bag is its ammo and brass cases. They are removable. You can take them out and use by themselves. To wash, at least. The bag is light when empty thanks to its construction. The material of the bag is rather sturdy, and it does not make this tactical bag heavier. This pistol range bag comes with a shoulder strap. 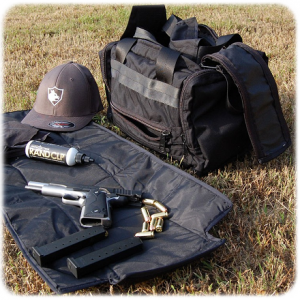 When the bag is full of pistol gear, ammo, and accessories, it is heavier than an empty one. The strap allows you to carry it not just in hands but over the shoulder as well. The bag is lightweight when empty due to 600D durable polyester it is made of. The bag is black and rather stylish. It is designed for keeping two pistols. The main compartment is quite roomy and has two dividers. There are two long and deep compartments on either side of the bag. All zippers are sturdy and have holes for small locks. The handles are sewn firmly. There is a shoulder strap, which can be attached to the bag with sturdy plastic clips. This pistol range bag is well-designed and can store many of your essentials. Into this bag, you can fit all your shooting equipment and even more. All of your essentials, such as gloves, targets, staplers, eye and ear protection, magazines, hundreds of rounds could be placed there. The side pockets have gun rugs. They are removable. You can take them out and put extra magazines there if you need. 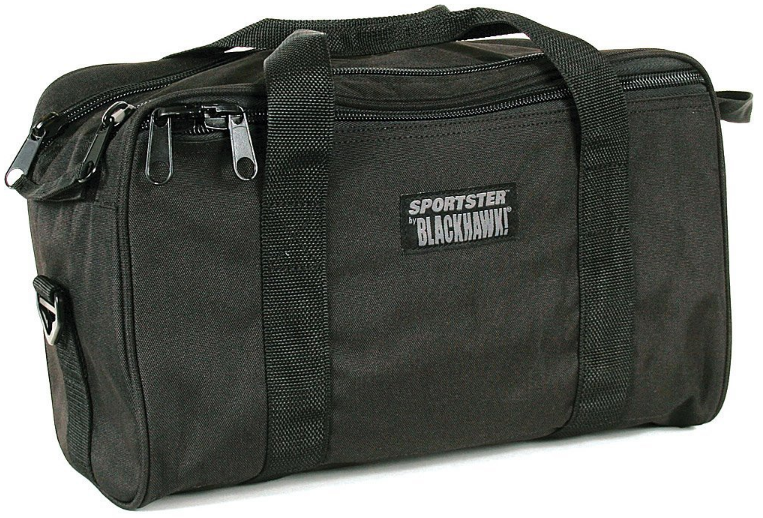 The BlackHawk Pistol Range Bag SPORTSTER is not a high-value bag and is very affordable. A good option for an attractive price.